Her Majesty Queen Rania on Sunday joined the Royal Health Awareness Society’s (RHAS) Capacity Building Open Day, where 375 Jordanian principals and teachers took part in a number of health-related workshops and interactive sessions, a statement by Her Majesty’s Office said.The event was organized in recognition of the 108 schools that received the Healthy Schools National Accreditation for the 2016-2017 academic year, with the aim of improving awareness of health-conscious practices among educators. Accompanied by RHAS Vice Chairman of the Board of Trustees Rami Farraj, and RHAS Director General Hanin Odeh, Her Majesty stopped by several workshops focusing on effective change management, school nutrition programs, utilization of health education technologies and the role of physical activity in preventing diseases. Educators also took part in sessions on subjects including time management, community mobilization and enhancing schools’ roles in tobacco control. 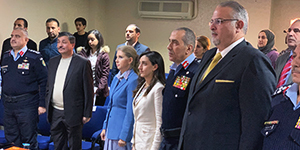 The event included a ceremony attended by Minister of Education Omar Razzaz, celebrating last year’s recipients of the Healthy Schools National Accreditation, 17 of whom received the gold accreditation, 30 the silver, and 61 the bronze. In addition, eight schools were awarded “Health Competency” status, allowing them to reenroll in the program for the next academic year. RHAS, an initiative of the Queen Rania Foundation for Education and Development, was established in 2005 to promote health awareness and empower Jordanians to adopt healthy lifestyles and behaviors. 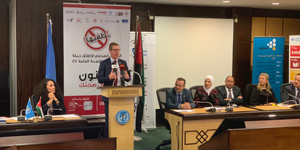 Targeting schoolchildren, youth and the community at large, RHAS aims to instill the foundations of preventive healthcare, which ultimately contributes to the well-being and safety of Jordanian society.